Angler and conservationist Ron McManus was well known in life for his efforts to promote artificial reefs and sportfishing along the Grand Strand. After he passed away in 2014, the S.C Department of Natural Resources established a new reef named in his honor. Now, the Ron McManus Memorial Reef has grown in size with the addition of a new boat hull at the reef site. The S.C. Department of Natural Resources (DNR) Artificial Reef Program recently deployed a 62-foot concrete-hulled boat in an effort to build up the reef site, also known as PA-04, at the mouth of the Little River in Horry County. "This is the second major deployment on this relatively new reef site," said Robert Martore, DNR artificial reef coordinator. "We hope to continue to expand this reef in order to make a fitting tribute to Ron, who put so much effort into protecting and enhancing our fisheries resources during his life." Artificial reefs, man-made structures laid on the seafloor, provide a foundation for the establishment of productive habitat for marine life, and attract fish and other marine organisms from many levels of the food chain. DNR has constructed dozens of artificial reefs off the coast of South Carolina to increase the amount of essential fish habitat and enhance recreational opportunities for saltwater anglers and sport divers. McManus" work to grow and promote the Jim Caudle Reef, named for a friend and fellow fisherman, turned it into the state"s most visited artificial reef. With the recent addition to the reef named in his honor, McManus" legacy will continue to grow. 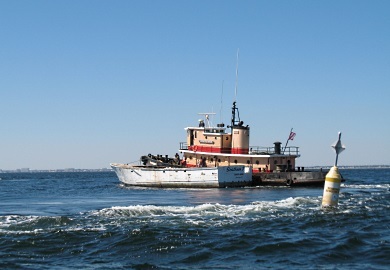 To learn more about DNR"s work on artificial reefs, visit www.dnr.sc.gov/marine/pub/seascience/artreef.html.